The very first lantern-slides painted on glass were mounted in solid wood frames. Sometimes there were several pictures on a slide, but in most cases a single one only. The small glasses with the pictures were set in recessed holes and held in place by means of a round metal spring. Also the first slides which were supplied in the so-called 'world-size' of 8,3 x 8,3 cm (3 1/4" square) were often delivered in a wood edge. Many times the slides had to be carried along back and forth, hence they used mostly light poplar for the framing. In England, however, mahogany was applied as well , moreover the Hamburg firm of Andres Krüss made use of this kind of wood because of its hardness and therefore being suitable for frequent use. On the wooden panels we often find labels mentioning the title of an item in different hand writings. This indicates that the slides were occasionally changing of owner. Besides that, it occurs that various titles are mentioned on the frames; from time to time it happened that a glass broke into pieces and in such case it was simply replaced by a another one in the frame. 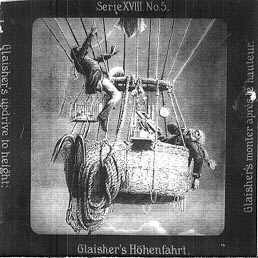 Perhaps the major part of the lantern slides was supplied in the shape of long strips of glass containing more than one picture on a glass. Initially these hand-painted glasses were also mounted in wood frames; as such they were less vulnerable and easy to handle during the projection. Along with the introduction of the 8,3 x 8,3 cm size the double slide carriers appeared on the market. The carriers enabled the presentation of wider types of long glasses too. This made the use of wooden frames redundant. As a consequence they disappeared, to start with the wider glasses, and later on also the narrower glasses for the small lanterns for use at home. Instead thereof the strips of glass were rimmed with a strip of glued paper in many colours and motives. Specific firms worked with distinct paper to be glued around their glasses. The glasses of Roose from Nurnberg (Germany) were often glued with pink squared paper, whereas Bing not seldom used white paper with golden stars. The wider glasses were frequently protected against damage by a cover glass. 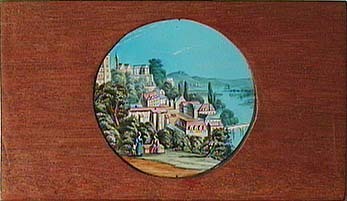 The narrow glasses, varying from 2 cm to 5 cm wide, which were fitted in the cheaper toy-magic lanterns were generally protected merely by a layer of transparent lacquer. There was no question of any standardized widths or lengths; every manufacturer was working with his own standards. Example: glasses of 6 cm wide are found with a length of 20, 20.5 or 27.5 cm. In the earliest examples the glass is often uneven and flawed by small air bubbles. Long strips of glass were supplied with hand painting work, decalcomania and with photographic pictures. On the long strips you can find three, four, five or even six pictures next to one another. These images are practically always circular round; occasionally also of square shape. The blank spaces between the pictures were filled with black paint. Besides there are also glasses on which the paintings have not been encircled. There is almost without exception a direct relation between the figures on these so-called panorama slides. These show e.g. a Christmas market with stalls or a parade of musicians. Such slides were slowly passed through the magic lantern without interruption. With other ones, on which the pictures have no or hardly any relation with each other, the figures were shown with intervals of rest, in exactly the same way as with the encircled images. Those glasses were mostly issued in series of twelve pieces, on which the pictures could be presented each separately numbered. Example: glass 1 contained the images 1 till 4, glass 2 the numbers 5 till 8, so completing a series of 48 pictures. In other cases the numbering was done on each single strip only or the glasses were not numbered at all. Repeatedly the packing-box of the small magic lanterns for use in the living-room contained open spaces in which a series of slides was delivered along. Depending on the possibilities offered by the lantern and its price, a single chromatrope or slipping slide was included as yet. 8,3 x 8,3 cm (3 1/4" square) and other sizes. Lantern-slides of 8,3 x 8,3 cm were mainly used in the bigger lanterns which were often used in support of 'teaching with visual aids', also otherwise called 'sciopticons'; for the smaller magic lanterns for private purposes the long strips were applied. Even if this size was called the 'world size', German manufacturers also produced slides of 8,5 x 8,5 cm. The slides were sold with as well as without a cover glass. Frequently the retailers fitted them out with a cover glass, if required by some customer. Hand painted slides, decalcomanias, glass transparencies and glass photograms also were launched on this size. (photograms are drawings multiplied by means of photography.) They were supplied in wooden frames with a metal or paper edge, or fully 'bare'. These slides were mostly sold in sets of 6, 8, 12 or 24 pieces, but also by the piece. The well-known series of the English company of Butcher & Sons, which were issued as 'Primus Junior Lecturers Series' during the period 1870-1906, were put up in boxes containing 8 slides each (see the Primus Catalogue). Stories such as 'Gullivers Travels' came out on 24 slides, divided over three series of eight pieces each. The ' Projektion für Alle'-series originating from Unger & Hoffman. Dresden /Germany, were a renowned and comprehensive edition. It was a first-class product which was often used for educational purposes. Those narrative or educational series were mostly offered with an explanatory text. This could have been printed on the slides themselves or loosely included on a small sheet of paper. The 'Projektion für Alle` series often came with an additional booklet with the accompanying text. Unfortunately, it goes without saying that such loose texts have got lost many times. At the same time there appeared many unbranded slides, without numbering or text, on the market; during their multiple use they were pulled out the original packing, which hampers the search for the original supplier of the slides often seriously. Moreover, many dealers marketed the slides under a 'brand of their own', whilst identical series sometimes were issued by different manufacturer. Finally we still want to mention the round slide, being a glass disc on which along the edges a series of images, whether in circles or not, has been put on. This one could only be applied in magic lanterns which had been specially made for this purpose by, among others, the manufacturers Bing and Ernst Plank. Sometimes we also come across very deviating formats, which appear to be then many a time cut up long strips of glass. This might be intended to grant a second life to broken glasses.